The Shah Noorani shrine in Balochistan was attacked on November 12, 2016. More than 47 people were killed in the attack and another 100 were injured. Several people were killed and injured due to a stampede caused by the blast and scores of injured were transported to the hospital in private vehicles by visitors who survived the attack. ISIS claimed responsibility for the attack. ↑ "Pakistan Shah Noorani shrine bomb kills 52". 12 November 2016. Retrieved 12 November 2016 – via www.bbc.com. ↑ "Blast at Pakistan shrine kills 43, wounds scores". 12 November 2016. Retrieved 12 November 2016 – via Reuters. ↑ admin2 (12 November 2016). "Shrine of Sufi Saint Baba Shah Noorani bombed in Khuzdar killing 47 believers". Retrieved 12 November 2016. ↑ "At least 45 dead, over 100 injured in Khuzdar's Shah Noorani shrine explosion - The Express Tribune". 12 November 2016. Retrieved 12 November 2016. ↑ "At least 52 killed, 102 injured in blast at Khuzdar shrine". 12 November 2016. Retrieved 12 November 2016. ↑ "52 killed in blast in Pakistani shrine". ↑ "ISIS bomb at Muslim shrine kills at least 25 people in huge explosion in Pakistan". ↑ "ISIS claims responsibility for deadly Pakistan bombing". ↑ "Isis claim responsibility for fatal Pakistan shrine explosion". 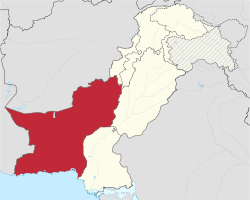 ↑ "52 killed at religious shrine in Pakistan by ISIS suicide bomber".